In this Garmin Fenix 5S Plus Review I will be looking in detail at the smallest & lightest of the Garmin Fenix 5 PLUS series of sports watches. We will have an in-depth look at its package of fantastic features and delve in a little more detail into its suitability as a triathlon watch. In some respects it WILL qualify as the Best Triathlon Watch…let’s see how. But wait a minute. The Fenix 5S Plus is also a highly competent contender for the Best Running Watch With Music as well as having; onboard payments, mapping and the vast array of smart, sporty and outdoors Fenix 5 features from earlier models. I’ll start with some general comments to help in your purchasing thought process before returning to go through some of the key aspects of the watch in more detail. The review is long so skip to your favourite section or sit back and enjoy the ride. The Garmin 5 Plus has just about every feature. The reality in 2019 is that all features work as they should. There are so many positives, that I’m just going to say that this is one of the very best/well featured sports watches ever – and I really HAVE tested ALL the others myself. The 5S Plus loses virtually nothing in the smaller format and is, for sure, the best sports watch for thinner wrists. I’m going to list the negatives because there aren’t many: price; screen resolution; is your bank supported? ; is your music streaming service supported; oHR might not be great for you; GPS is good but not great; Garmin Connect is feature-full but sometimes hard to navigate through. Almost all of you will not regret buying one…if you can afford it. The key difference with the Fenix 5S Plus is that the ‘S’ is for small. If you prefer a smaller watch format then this is the one you would go for. However you might be concerned that you are missing out on something because of the smaller size format. Fear Not: You are not missing out on features ! With the previous non-PLUS version (ie the Fenix 5S) then the actual display size WAS smaller. On the Fenix 5S Plus the display is the same size as the Fenix 5 Plus and the same size as the Forerunner 935 triathlon version. ‘All’ that Garmin have effectively done is to make the bezel/non-display area slightly smaller and hence the overall watch slightly smaller. The ONLY compromise is that this means that there is then room only for a smaller battery and hence battery life. You buy a Garmin high-end watch primarily because it is jam-packed full of SPORTs features, many of which you won’t even find in the menus – let alone use them. That doesn’t matter that much, as the features that you DO need will almost certainly be included. Even if your must-have feature is missing there will be a CIQ app that can be added to the watch for free. The Garmin Fenix 5S PLUS is a PROPER sports watch, it’s even one of the very few PROPER triathlon watches. If you are an ‘International’ Age Group triathlete then I would recommend it to you. If you RUN with MUSIC, I would recommend it to you over the Forerunner 645 MUSIC or VIVOACTIVE 3 MUSIC. Indeed it’s probably even better than Garmin’s ‘best’ running watch ie better than the Forerunner 645 Music. The other reason you wouldn’t buy it is the aesthetics. Personally I do not like the polished metal bezel of the standard version (but there are other versions and more may come in the future). Another aspect of the aesthetics is the lack of ruggedness – typically the Fenix products have been very much outdoorsy and rugged watches. The Fenix 5S PLUS is kinda ‘normal’ looking. The Fenix 5S PLUS will function PERFECTLY WELL as a 24×7 watch. It’s smart enough to wear to work; yet one aesthetic downside is the screen resolution. The resolution is not great and the colours are a bit dull. If you are going to be sitting next to people wearing Apple Watches and WearOS watches then their screens WILL, for sure, look superior to yours. Your Fenix watch WILL PROBABLY BE MORE COMPETENT under the hood…it just won’t look so good. So will you really wear it 24×7 because of that? If you won’t and if you just want a sports watch for your sports then you could consider an entirely different route with a ‘fancy’ watch AND a separate sports watch. There’s also the thorny issue of accuracy. If you want a super-accurate sports device then you might look instead at Polar or Suunto. Even with GPS+GALILEO the Fenix 5S PLUS is NOT more accurate than some of the competition. If you want to see how fast you are running (only running, not cycling) then you will need a footpod. Similarly if you want accurate heart rate then, whilst the Garmin Elevate sensor is one of the better ones on the market, it’s still not accurate enough for me. Then again there are no wrist-based optical heart rate sensors that are accurate enough for me. OK. Let’s crack on with a more conventional and detailed look at the Fenix 5S Plus. Let’s start with the unboxing and a look at what it is supposed to be able to do. You get the watch, a manual and a bespoke USB charger. That’s it. The bespoke connector is fine and fits either way around. The main issue I have is that when there is sweat inside the port (hole) on the watch then the Fenix may continually connect/reconnect when attached to a PC. The solution is to blow into the watch port to get the sweat out. It’s a standard 5-button sports watch, solidly made with no touchscreen. The screen is either strengthened glass or optional, harder, sapphire crystal. The display is officially classed as “sunlight-visible, transflective memory-in-pixel (MIP)“. The colour screen is somewhat dull, with the colours washed out. It has a fairly good backlight to aid visibility in many light conditions. The glass face is very slightly recessed below the stainless steel bezel. The bezel appears plain except for two decorative grooves at 6 o’clock and 12 o’clock. On closer inspection the bezel has faint words denoting the main functions of the 5 buttons. The stainless steel underside of the Fenix 5S PLUS has the port for the USB connector and the latest Garmin ELEVATE optical HR sensor module with 3 green LED lights. The QuickFit 20mm bands are easily removable in a few seconds without the aid of tools and are interchangeable. The supplied bands are a nice standard of silicone and quite comfy for most of my sporty and non-sporty uses. They are approximately 70mm and 110mm long, excluding the buckle. I have thinner than average wrists and the default, 20mm wide band is almost not long enough for my wrists. That extra 2cm, or so, in length in the 5 Plus model makes a difference. This comparison clearly shows the slight size increases in size from model to model. The Fenix 5 Plus model is comparable in size with the Forerunner 935 yet, as I’ve already pointed out, the 5S Plus is smaller, slightly thicker but with the same and more functionality as the 935. As this picture shows the increased 4mm width to the larger size 5 Plus also comes from an increase in the redundant black area around the screen (see the 935 to the left). Again, the actual display areas of the Fenix 5 Plus/935 are the same. Sapphire, scratch-resistant lens (£100/$150 additional price). Garmin-branded suede and steel band options are available. Different colour options and band options are offered by default with the Sapphire version. Some colour version are available in the 5 PLUS and others in the 5X PLUS. These components give the Fenix 5S Plus its base level of ability upon which the software leverages the functionality you see and use. I’ve softened the wording of the techiness to explain what the various bits do in plain English. GNSS capability encompassing GPS, GLONASS and GALILEO satellite constellations. More satellites increases the chance of accuracy being obtained but using more than the one GNSS system will increase battery usage. GPS can be used to determine you 2D position and your elevation with 3D positioning. Barometric Altimeter – if air pressure falls you are assumed to have gone ‘up’. This could be a flight of stairs or a mountain. Over time there are weather-based changes to air pressure and hence, unless corrected, you can appear to go up or down when, in fact, you are going nowhere. GPS 3D positioning can be used to correct such drift as can you passing through a point on a map with a known elevation. Compass – you know what it does. But the Fenix compass can be nuanced to, for example, show true North and magnetic North. Gyroscope – can be used to measure orientation and angular velocity. A simple turn of your wrist could trigger the backlight to turn on. Battery – up to 11 hours of GPS usage. Music reduces this to 4.5 hours. GPS usage can be paired back in UltraTrac mode to enable 25 hours of sports usage. 7 days as a regular watch. Storage – 16GB for maps and activities, 4GB for music … not as much as it sounds. Bluetooth enables a smart connection to Garmin Connect Mobile on your smartphone and then to upload workout data – but also to receive call and app notifications from the smartphone. Many other smart features exist, such as music control for music on your smartphone and pre-canned answers to SMS messages. Here Garmin’s software and some 3rd parties’ software leverage the capabilities of the device we have just considered. The Garmin Fenix 5S Plus reviewed here has a LOT of pre-existing features. I’ll list them by ‘type’ and add in some commentary for parts that I think you might find interesting and useful to inform you in your purchase. Firstbeat – Firstbeat physiological algorithms are integrated into the Garmin ecosystem. That means both on the watch and on the Garmin Connect software on your smartphone and on the web. Firstbeat do very clever things with heart rate data, both ‘simple’ heart beats per minute and the variation between those beats. When coupled with other pieces of your workout data, great insights into your performance can be delivered to estimate, for example, your: VO2max; Lactate Threshold HR (LTHR, AnT); training load; training status; recovery time; readiness to train; performance condition; and MUCH more. This physiological data, in part, can now also be sync’d between your devices using Garmin Physio TrueUp. Many smartwatch buyers initially want 24×7 heart rate (which you have) and VO2max data but very soon the Firstbeat algorithms deliver you VERY MUCH more insight into what is going on in your body from a sporting perspective. There is a much more detailed section further below under ‘Specialist Features’ comprehensively explaining the many Firstbit features. I sense that the market is now moving away from simple activity trackers. Nevertheless, like most other manufacturers, Garmin’s activity tracking capabilities are considerable. Goals – including progress towards auto goals and manually set goals. Sleep monitoring – You can now get some POSSIBLE insights into your sleep quality and sleep stages. Every athlete knows that it’s when sleeping that their body adapts to the exercise rigours of the day before. The RIGHT kind of sleep is KEY to getting faster. Garmin’s ELEVATE sensor is now able to leverage resting HRV data as well as movements from the accelerometer/gyroscope at night. From “Where’s my phone” to “control my phone” to “what’s the weather?” you can get some clever stuff by linking to your smartphone. Much of this is the same on competing devices from other manufacturers. Find my watch or phone – works either way ! The main feature sets in the Fenix 5S Plus cover running, cycling, swimming, triathlon, golf and general outdoors/hiking. Some of the individual features work across sports. Garmin has a training calendar to schedule workouts and deliver them to you to follow on your Fenix. You can buy online training plans to further automate & simplify this. As of July 2018, Garmin have started to introduce ADAPTIVE training plans though Garmin COACH and this will likely improve in coverage and supported ability levels over time. Race an activity – ie a previous effort by you or a friend. This brings in the knowledge that the previous effort may have been slower up hills ie a varied pace is followed. Round-trip course creator (running/cycling) – this has some feubles when in use but is ideal for holiday and exercising or exploring unfamiliar areas. Trendline popularity routing – your routes will follow those most often used according to Garmin’s database of our movements. Configurable lap alert message – normally I use autolaps and want to know how fast I ran that last km. Lap Time normally suffices until I press a manual lap when the time is mostly meaningless…I’ve added Lap Pace to cover knowing how fast my last manual laps was. Fully customisable (Multi-) Sports Profiles – Certain kinds of data are important to any given sport and to you. Pre-canned profiles do, for example, include SPEED rather than PACE for a cycling profile and might turn off GPS for an indoor profile. REPS might be added for gym workouts. And so the list goes on to N levels of detail. Even if the pre-canned profile is not right for you, then you can change it. Probably the only downside that stands out here is the restrictions of the screen size – ie a smaller screen limits what can be shown and if you make the data fields too small then many people can’t read it. So Garmin let you have 1 to 4 data fields on one of several pages per sport profile. It will almost certainly do what you want it to. If not, 3rd party apps can also be used to display in-workout screens and specific data fields. 3rd party apps can even add more than 4 datafields to one screen. GNSS – GPS/GLONASS/GALILEO/UltraTrac give you a pretty track showing where you’ve been. They also tells you your speed/pace and position on a map. But GNSS/GPS uses a lot of battery power, reducing battery life, and accuracy varies according to conditions. UltraTrac exists to extend battery life by periodically enabling tracking – it’s useful for long hikes or, perhaps, longer triathlons. GALILEO and GLONASS sometimes improve position recording in built-up areas and under tree cover. Normally I’d say “Just use GPS“. Your workout data can be recorded every second or ‘smartly’. SMART (default) seems to mean that something is only recorded when some data changes eg speed, cadence, direction. I’d change this to record every second. Strava (live) Segments – check your progress against friends on your favourite segments. Also included is segment information like elevation, a map, and the race time of the segment leader. Same for Garmin Segments. You can race segments live on the road once downloaded to your watch. You’ll need Strava PREMIUM for this. LiveTrack – your family, at home or ‘race-side’, can check your progress that is broadcast via the smartphone you are carrying. Group LiveTrack – If your group enable live track then this will tell everyone where everyone else is; assuming they are all carrying a phone as well. Auto scroll – consider this if you have more than one page per sport profile. This feature sounds good but I find it annoying in practice. Manual lap – creates a new lap. At the same time ending the last autolap, if there was one. If you are buying a top-end watch at this price point then you should probably also buy a HRM-RUN (or HRM-TRI) and a decent footpod (STRYD/RunScribe) to get all the benefits from what the Fenix 5S Plus offers. Treadmill running and trail running profiles are supported and you can create your own custom running profile too. Whilst the Fenix will produce fairly accurate running cadence from the WRIST (yep), a footpod will be useful to give accurate running pace from its highly accurate stride length info. Advanced running footpods like STRYD and RunScribe will also give you running power, super-advanced running gait metrics and accurate instant running pace – in the case of STRYD that requires no calibration. If STRYD/RunScribe are a gadget-too-far then a HRM-RUN (or HRM-TRI) is a good investment to give you accurate heart rate as your Fenix will give you inaccurate optical HR – despite probably being accurate enough for casual reference to HR. The other benefit of buying a HRM-RUN is that it will give you additional running metrics namely vertical oscillation and ground contact time. After 6 or more minutes into your run your Performance Condition is displayed as a ‘pop up’. The higher the value, the more you can ‘go for it’ for the rest of the workout. If you are racing and training at hard levels then you may want to know your Lactate Threshold HR (LTHR, AnT, LT2). Above this point things progressively go pear-shaped with your performance yet, if you are well-trained, you will be able to operate in this state for over an hour. Garmin/Firstbeat autocaclulate and update this periodically. It’s a very useful pacing tool, although I find it slightly over-estimates my LTHR. Finally, also a Metronome – Hone your cadence with a beeping metronome. Gets annoying after a while ! A LOT of metrics are pre-installed on the device and there are additional data fields you can get from Connect IQ. Here are some of the ones on the device: (Last)Lap Time; Elapsed Time; Avg. Lap Time; (Lap) Distance; Last Lap Distance; (Current) Pace; Average Pace;LapPace; Last LapPace; Speed; Average Speed;(Last) Lap Speed; Maximum Speed; Vertical Speed; Heart Rate; Average HR; HR Zone; Aerobic TTE; Anaerobic TE; HR% Max; %HRR; Avg HR %Max;Average %HRR; Lap HR; Lap %HRR; Lap HR %Max; Tiem in Zone; (Avg.) Vertical Oscillation; (Avg) Vertical Ratio; Avg/Lap GCT; Avg/LAP Gct Balance; (Avg) Stride Length; (Avg/Lap) Cadence; Temperature; Avg Ascent; Avg Descent; Max/Min Ascent/Descent; Elevation; Total/Lap/Last Lap Ascent/Descent; Min/Max Elevation; GPS Elevation; Glide Ratio; Grade; Heading; GPS Heading; Compass Heading; Navigation fields; Muscle Oxygen Fields; Calories; Battery Level; Performance Condition; Laps; Sunrise/sunset; and Time of Day. The Fenix 5S Plus supports Garmin’s Running Power (GRP) Algorithm provided you also have an HRM-RUN or RD-POD. It’s a freebie; so it’s good to try out if you are intrigued by running with power as proxy measure of effort. Running Power *IS* useful on undulating courses, in my opinion. If you want to use running power more seriously (properly) in your training then you need to quickly decide to go with either RunScribe or STRYD as your history of power workouts from GRP will not match the STRYD/RunScribe data going forwards. CIQ Running power datafields and apps ARE supplied by STRYD, RunScribe and Garmin’s own Garmin Running Power is also a CIQ app. However RUNNING POWER is NOT yet properly integrated into any Garmin watch. Once this is agreed by the ANT+ organisation then Garmin and other vendors can implement it. What this means for you, for example, is that you do not have the on-watch features with running power that you might be able to with HR. For example, you can create HR alerts but you can’t create RUNNING POWER alerts (actually you can but not in the same way – see CIQ). Display // Navigation – The screen size on the Fenix is clearly smaller than on many of the best cycling computers. If you take cycling seriously you have a couple of options: buy another computer and leave the Fenix at home; buy a bike computer for display purposes but still use the Fenix as your main workout recording device; buy a specialist dummy bike computer like the Edge 130 – dummy in the sense that data FROM the Fenix can be cast onto the Edge 130’s display. The Fenix is supplied with Garmin’s routable, cycling-specific street map – that’s pretty cool but the screen size will limit its usefulness when cycling at any normal speed on intricate routes, especially on trails where turns are less obvious. Safety / Commuting – Compatible with Varia rear-facing radar and with Varia lights. These accessories are ‘smart’ and have many interesting features. I don’t use them routinely but I would suggest a closer look if you cycle regularly for your commute. eg Proximity alerts and changed flashing light patterns as vehicles approach. Advanced training and racing – will be enhanced by a power meter. The best power meter solution for entry-level cyclists with a bit of cash is likely to be Favero ASSIOMA pedals or a Stages Crank. Training & racing with power is a broad subject and can get complicated quite quickly. The Fenix 5S can asses your ‘FTP‘, from which many power insights are derived. A useful cycling feature is where you can race an activity (either yours or someone else’s) and you are informed how far ahead/behind you are. You can take this to super-complex levels by linking to BestBikeSplit and get optimised race plans for the course you are doing that even take into account wind. Time and distance alerts are supported as are more complex alerts. These are activated if, for example, you exceed various cadence or power thresholds. If you are a time-trialist or just like your gadgets then the Fenix 5S Plus is also compatible with Varia Vision – a heads-up display. Openwater and pool swim profiles are both available with stroke detection. Openwater has GPS enabled and you can set a custom pool length when using a pool. If you use an outdoors pool you use pool mode. Rather uniquely Garmin now allow you to follow complex structured SWIM workouts. That’s a relatively recent addition – 2016 IIRC. The swim functionality is pretty awesome and comprehensive enough for me. In my opinion the stroke detection algorithms are now very good and give a high degree of accuracy – but not perfect. The onboard accelerometer detects when you push-off from the end of the pool. If you are lane swimming with other people and you stop or change your stroke then your Fenix won’t be able to ‘see’ that and your results will be impaired. The swim metrics are good and include distance, pace, stroke count/rate, lengths, calories and SWOLF. These metrics are included on many non-Garmin watches these days but Garmin have additional swim functionality with DRILL LOGGING (you tell the watch you are doing – say 100m of drills that it would not otherwise properly recognise) and there are also extra functionalities built into rest periods between sets where, for example, you can have a countdown timer to the next rep.
Heart rate data when swimming is not enabled on your Fenix’s optical sensor. Presumably because Garmin cannot make it sufficiently accurate (fair enough, it’s hard) – although Suunto and Polar (M600) both support live, optical HR when swimming. If you want HR data whilst swimming then Garmin require you to buy either a Garmin HRM-SWIM or HRM-TRI chest strap – the names kinda give away the intended uses, although it’s perfectly OK to use the HRM-TRI in a pool (I do). The HRM-SWIM adheres better to your body when doing a tumble turn and has better longevity resistance to pool chemicals. However even with these expensive chest straps you still do not get live swim data as you swim, although you can get it in between sets when out of the water. The HR data is downloaded to your watch at the end of the workout and includes a recovery mode for when things go wrong (once a year or so for me). You can send your swim data to swim.com or other sites for more insights. I use SportsTracks& Golden Cheetah desktop software FWIW, others use TrainingPeaks. Triathlon features encompass those set in the constituent sports profiles. Garmin is uniquely awesome in properly supporting ‘any triathlon’ or, more correctly ‘any multisport event’. Ability to make a custom multisport profile eg Run-bike-run (duathlon or Swim-run (aquathlon) or Swim-bike (bikeathon) or PoolSwim-Bike-Run (pool-based triathlon) or OWS-MTB-trail run (cross triathlon). There is a 5 sport limit. However REPEATS are a recently added function that, for example, allows you to repeat swim+run very many times like in Otillo. You may also perform repeated BRICK profiles in training such as repeats of RUN-BIKE. This is a more than acceptable workaround to the 5 sport limit. Outdoor and recreation features are covered in a variety of profiles: Hiking, Climbing, Skiing, Snowboarding, XC Skiing, Stand-Up Paddleboarding, Rowing, Kayaking, Jumpmaster & Tactical. The profiles have their own nuances, for example skiing will give you specific RUN stats. The Fenix 5S Plus, indeed all the Fenix 5 Plus series, gives you a free global and routable map, Basically you can follow a route like your car’s satnav and you can get redirected if you go off course. Many other competing products will simply support a pre-defined route that is a series of GPS points (breadcrumb)…if you go off track then the only intelligence to help you renavigate is to either backtrack or follow a compass heading to some point. Point-to-point navigation – does what it says. The Around Me mode enables navigation to nearby, pre-loaded POIs and waypoints. Garmin XERO can use laser sighting to create waypoints as-you-go. Round trip – creates a route back to the start for a specified distance. Sight ‘n’ Go – physically point the top of the watch to an object and press go! Draw map contours, lock on road, auto zoom, map orientation…you get it. Garmin have spent a lot of time thinking about this AND implementing it. There are some nice screens and special outdoor features. Elevation profile – It’s simple enough to imagine a plot of your entire workout by altitude – there’s nothing new there. But there is the new ClimbPro functionality which gives you specific information about the current and next planned/navigated climb in your workout. Finally there are some specific aspects of outdoors activities that are supported via Garmin’s CIQ apps and these are: Area calculation; hunt/fish calendar; and sun/moon info. CIQ apps will also give you MUCH more than that. I can hit a golf ball and once managed about 20 over par (18 holes!). My golfing knowledge ends there so I’ll just list the features and not pretend to know what I’m talking about. The features look mostly self-explanatory and you should know that most of the world’s golf courses have been digitized on various golf databases. Garmin clearly has one. I’m assuming that the courses will never tell you the precise pin position on any given day. There are insights into swing metrics (TruSwing accessory) as well as simple stroke counting and your GPS position is used to determine where you are on the hole. My understanding is that some electronic golfing devices are against some competition rules. #Check. initially only the Fenix PLUS series of watches had the GALILEO GNSS (read ‘GPS’) capability. However within a few weeks Galileo was also rolled out to the earlier Fenix 5 watches and the Forerunner 935. It will not be rolled out to the Fenix 3. Garmin Pay turns your watch into a contactless card. Most reviewers appear not to have used this functionality. It’s not complicated. BUT it does require a supported bank. And that specifically means BANK and not a generic VISA or MASTERCARD. So I have a Starling Bank (UK) Mastercard which I got solely for the purpose of reviews of Garmin and Fitbit products. Here is a list of supported banks continually updated by Garmin, for your bank to work it absolutely MUST be on this list: link to garmin.com. I added my Starling card via Garmin Connect mobile. There were a few feubles with that process but it was generally alright. When I transfer funds by phone from my First Direct account to my Starling account, the money is available to use on the watch within 10 seconds. Other banks may take longer. The passcode seems to only be required if you have taken your watch off since you last made a purchase. There may also be a long time limit in there as well. So; Garmin PAY is a neat solution and I’ve generally become more amenable to it the more I’ve used it. It is convenient for small purchases. The downsides are the need to sometimes enter a passcode whilst queuing and the mechanics of twisting your wrist and presenting the watch to the terminal. From the other side of the till, the shop assisstant is not always ready for you to pay by ‘contactless’ as, for now, they normally expect to see a contactless payer physically holding their debit/credit card. ie the watch is not so obvious. If music be the food of running, play on, Give me excess of it; that suffering, The pace may slacken, and so die. I wouldn’t go as far as dying Will, but lots of people do like to run with music and, by extension, podcasts. After all, an MP3 is an MP3 is an MP3. First up: there’s no speaker. Quite a few running watches do have inbuilt speakers. So you are dependent on your bluetooth headphones/speakers having a decent battery charge with the Fenix 5S Plus. If you want to live-stream music over the internet then you will need to “dream on”, rather than Shakespeare’s “play on”. No Garmin has got any kind of inbuilt cellular connectivity. You’d only technically be able to live streamt via a smartphone when running…yet another thing for you to carry and charge. And that’s pretty pointless as we already know that MANY watches can act as a remote control for the music played via your phone. So you would be better of using your smartphone if you want to live-stream music as you run. What Garmin present in their music offering is flawed. But the same is true of nearly all of the other competitive Running-With-Music options. There’s a Looong way to go before the perfect running+music device exists, much of the delays will be caused by music licensing restrictions. What Music Will go on My Garmin Fenix 5S Plus? Garmin claim 500 songs can be stored and the total space on the Fenix 5S Plus is 4Gb (3.6Gb is available). The special MTP connection with the new charging cable copies them to the Fenix relatively quickly. The Fenix NOW supports Spotify and Deezer (‘soon’ at these locations) and iHeartRadio (USA, CA, NZ, AU) in ‘link and sync’ mode. Ie when you have connectivity to those services via your smartphone/wifi then you can copy tracks to your watch to playback later. When released, Deezer should link and sync over WiFi and I would hope it also supports dynamic playlists. iHeartRadio CIQ app on Garmin Connect ouch (Rating: 2.5/5, Developer states 500mb limit in July 2018 – #OhDear). iHeartRadio app CAN be downloaded in any country. It will only work in the correct regions. ie not for me, I tried. For those of you in the USA, you store your logon credentials via the app on GARMIN EXPRESS. Do you have losslessly compressed, high-definition audio files in the relatively common .FLAC format? Well, you can’t use those either. #OhDear. But you can use all of these; mp3, m4a, aac, adts, wav, m3u, m3u8, wpl, zpl and pls. That’s not too bad I suppose. You can play a pre-loaded playlist but you can’t create one on the watch or in Garmin Express. It’s also worth noting that many users have found that wearing your Fenix 5S Plus on the same side as the controls from your headphone reduces dropouts – when running. Normally your right wrist. When you are not running playback might be OK from your left wrist. As mentioned before the controls are a little cumbersome … but work. Finally you get to run with the album art possibly shown in all it’s low-res glory. The sound quality is pretty good if you have good earbuds like the Jabra (Jabra Elite Active 65t Review ed here in lots of gory detail). Sound quality is determined by a lot of factors. In comparisons that I have made against other devices my working assumption is that Garmin currently only support the standard SBC audio codec. A half-decent smartphone will additionally support the AAC codec. If your headphones support the AAC codec then you WILL NOTICE a significant difference in quality from your smartphone over that from the Garmin. AAC is much better and the Garmin will never sound as great. However it’s alright. Note: If you think this lack of AAC CODEC info is wrong please let me know below. We’ve just seen that the status of supported online/streaming services from Garmin is somewhat ‘up in the air right now’. By 2020 it should be more obvious where Garmin’s support for music is heading. Other concerns can be raised about the offline, storage-based offering from Garmin. Is there enough space? Is offline storage the way to go long term? However the legacy mode of copying files to your watch works well enough. BUT BUT the most practical thing of all is that Garmin’s button-based interface for controlling music is BY FAR THE BEST of any of the running watches that control music. Try skipping a track on Google Play Music on your LG Watch when you’re hot and sweaty and it’s raining. Garmin’s button are, well, buttontastic. Because they work for sport…all the time…every time. All of the Fenix 5 PLUS models now have inbuilt global full colour TopoActive maps. The original Fenix 5 series only had maps on the top-end 5X model. I seem to have free maps for all the regions, this might not be the case if you buy the 5S Plus elsewhere…check. The addition of maps is moving the Fenix forwards in broadly 2 ways: a more complete routing experience; and openness to smarter, location-based CIQ apps. The ‘more complete routing experience’ is a kinda obvious statement. Previously there were NON-intelligent breadcrumb trails and now there is all the intelligence of a car’s satnav to re-route you over proper roads & trails when you make a wrong turning. Overlay on top of that all of Garmin’s pre-existing functionality around compasses, round trip routing, barometric+GPS altimeters and you soon start to have a pretty cool outdoors tool. Effectively POIs of many types are overlain onto the map. So you can do very much the same sort of thing on the 5S Plus as you can on your Satnav eg you can navigate to the nearest Bank should you so desire. I would say that the POI-based navigation works well and one of the first things you might do is add a custom POI as your ‘home’ or your hotel in a new city. I have followed walking instructions in an urban area and the experience was ‘functional’ ie it worked. However there were some delays and perhaps too often repeated instructions on when to turn. These instructions took over the entire screen and so obscured the map. So couple the fact that you can’t see the map with a notable degree of positional inaccuracy in a built-up area and you really could get lost quickly. However, as I was walking, there was plenty of time to plan ahead by looking at the map when it was visible. The Fenix 5S Plus was also fairly good at orienting itself the correct way despite itself pointing the wrong way when when on my wrist (think about it) ie it knew my direction of travel and orientated itself properly. There was also a reasonably nice degree of autozoom which seemed to be based on my speed and proximity to the next point of direction-change. I also followed a route whilst running a nearby trail. I tried the exact same route with the original Fenix 5X when it first came out. The original Fenix 5X just didn’t work; however the 5S Plus was pretty good. I was also deliberately listening to music at the same time. With the distration of music the buzzing naivgational alerts, buzzing performance condition alerts and buzzing autolap alerts are prehaps too much and I missed my turns a few times. The display was readable even through sunglasses. Take this kind of navigation up to a bike moving at greater speeds then there are further issues. First up the screen is small. If it’s on your wrist it is dangerous to ride one handed and look at it and it is mounted on the handlebars then it is a fair distance away from your eyes. A larger-screened bike computer would definitely be better. However the Fenix 5S Plus WAS passable as a BikeNav. When cycling on roads, even despite slight lags, I had sufficient audible and visual warning to know when I next needed to turn. Cycling on unfamiliar trails was a different matter entirely as it is very easy to zoom past a part-hidden turn off. I also tried a 10 mile round trip route. After waiting a minute I gave up. It’s too slow Garmin. But in the absence of a bike computer and in the absence of ‘nothing’ the Fenix 5S Plus is certainly a move in the right direction. Would i ever use it as a Bikenav? Yep, maybe. Although I do have better BikeNavs. I’m only making these negative points so you can appreciate the limitations you might encounter. Occasionally those limitations would be a minor inconvenience but if you were riding on new trails every day the the 5S Plus would be the wrong device for you. Garmin’s inbuilt mapping functionality can show you the POIs around you. There are definate limitations imposed by using the 5-button interface to navigate to them. A touch screen that supports pinch and zoom would DEFINATELY be better (providing it worked). However for occasional and more recreational-type navigation then 5 buttons are nice enough. In the image shown below, the active segment of the watch face can be changed and then selected to bring up a list of POIs ordered by the closest first. It’s a little cumbersome. But it works. Although having said that some of the mapping functions are sometimes a little too slow for my liking. Putting all that to one side, what we are going to see moving forwards is Garmin’s mapping functionality being opened up to app developers. For example on Garmin’s Edge devices we have already seen the Yelp app (link to: garmin.com) which can add more context to a simple POI such as including a shop’s opening times or reviews. So the mapping is probably going to be improved to support your NON-sporting activities as apps develop over time. This is the one thing you will miss out on by buying the 5 Plus or 5S Plus. It’s a highly specialist blood oxygen sensor (SpO2) for intermittent use when acclimatising during climbing. There are also potential medical uses. If you don’t know exactly what it is already then it almost certainly will be of no use to you whatsoever. PulseOx/SpO2 is totally different to Moxy/Humon Hex. You can pair sensors that are either Bluetooth SMART (BLE) or ANT+. YES!! This IS correct. You can connect to the Garmin Connect app on either iOS or Android or to a computer via Garmin Express and the charging cable. Once you have paired to the app you can also automatically pair to WiFi networks that your smartphone is already paired to. Obviously you can pair headphones (or Bluetooth speakers) to listen to music. I’ve tried several pairs of Jabra headphones and 3 lesser known brands and they all, superficially at, least paired. I do not know of any comprehensive list of headphones that work but try this for starters for the Forerunner 645 (Link to: garmin.com). Note also that some headphone controls might not work when linked to the Fenix 5S Plus. Some (most?) headphones and earbuds appear to work best when you wear the watch on your right wrist, this is because the right side is often when the main controlling headphone/earbud is located and so signals do not have to pass through your body. The classic Garmin GSC-10 combo sensors was the one to use a few years back. That’s still fine but it is a BIG pain to switch between bikes so the new, more expensive and separate Garmin speed and cadence sensors are a great choice. Cheaper non-Garmin alternatives exist eg Wahoo. Other than for indoor usage almost everyone will only need a cadence sensor. Getting your speed & distance from GPS will be mostly fine. This could be a chest strap or an arm band. 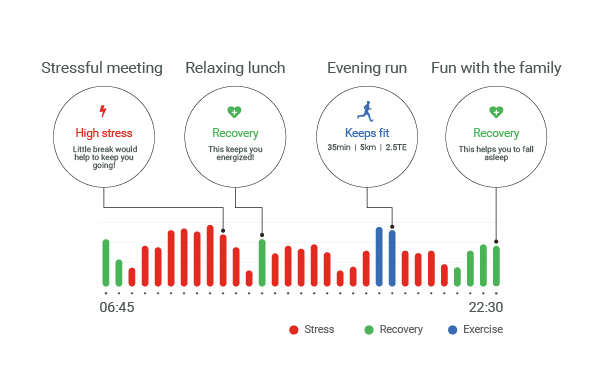 I love the HRM-TRI as it offers additional features to the Fenix 5S Plus/935. The HRM-TRI would be a great option for you but there are many heart rate monitors at half of those prices that still give a perfectly good and accurate HR reading eg Wahoo, Polar, 4iiii, Scosche, Runar. Optical armbands such as the Scosche Rhythm, Polar OH1 and Wahoo Tickt Fit ARE surprisingly accurate but any optical HR on the wrist WILL have problems during sport. The Fenix 5S Plus can broadcast the heartrate it senses from the optical sensor to other equipment eg to some gym equipment or to your bike computer. ie it can act like a standalone optical heart rate monitor. A properly calibrated footpod will give you accurate pace. Many will only be accurate over certain pace ranges eg Garmin. The Milestone pod is cheap and cheerful and STRYD’s pod is expensive but accurate, also giving you running power. The cheaper STRYD Live omits the POWER metric. I noticed no data dropouts with STRYD and RunScribe – there ARE dropouts in the non-Plus version. This is a clip-on pod that gives running dynamics data like the (Effective) Ground Contact Time and Vertical Oscillation. You’ll get the same from a HRM-RUN chest strap. These sensors along with GPS will feed into Garmin’s free Running Power CIQ app which we will discuss later in this Garmin Fenix 5S Plus Review. I’m not convinced that these sensors (and GPS) provide sufficiently accurate inputs to give meaningful results in Garmin’s Running Power (GRP) app. But GRP is free, so give it a go. Really I wouldn’t bother buying one of these. The metrics are not really actionable. You WILL get cadence from inside the watch and that IS accurate enough to be actionable AND cadence is the quickest win that most people can make to improve their technique. Basically…make cadence progressively higher over time; and lovely things fall into place, naturally. …these are all more exotic sensors you might want to connect to your Fenix 5S Plus. Garmin’s app is one of the better sport and activity apps. I like Fitbit’s and Polar’s too. The Garmin app is fully comprehensive: sleep, steps, sports, day views, trends, physiological stuff. It’s all there and more besides. There is SO MUCH data in the app that sometimes it’s not always so intuitive to know where to look to find the information you need. But it is there. Somewhere. All your data is sync’d to Garmin Connect online and the same sort of thing is available on that platform. And it’s all free. Here are several screenshots of the app from a few months back, including one of my GPS accuracy test route. More on that later. Those of you who have more than one Garmin device will notice that your PRs/PBs and some other physiological recordings are starting to be synchronised across the Garmin ecosystem using Physio TrueUp on supported devices – of which the 5S Plus is one. There are many aspects of the Fenix 5S Plus that will be accurate to varying degrees. The steps and stairs climbed will be accurate enough for the purposes that the data is put towards. Garmin’s sleep analyses are well-intentioned but I’m near positve, from other research, that they will not accurately represent true sleep stages. But I have no way to back up my assertion (and neither would Garmin). So that leaves us looking at the accuracy of Elevation, GNSS/GPS and heart rate. People tend to ‘Poo Poo’ the accuracy that other people seek from devices when that aspect of accuracy is not important to them. For example the small minority of cyclists who use power meters (of which I am one) might have a vocal sub-minority that tend to look down on those seeking GPS accuracy or HR accuracy. Runners, in response, might cite the almost certain fact that there are a VASTLY greater number of people looking for GNSS/GPS accuracy that there are cyclists looking at the differences of between 98-99% accuracy in power meters. Similarly, for all its flaws, heart-rate based training is used by a VERY LARGE number of people across many sports. I use heart rate a lot and I am mostly aware of all its accuracies. However one thing I’m mildly concerned about is that many people are probably using optical heart rate and blindly assuming that it’s always correct. It isn’t. So with all that in mind. Let’s look a bit more at the accuracy of GNSS/GPS/GALILEO, heart rate and elevation/altitude. As of 24 July 2018 my recommendation for you is to just use GPS. Turn off GLONASS and turn off GALILEO – for now. That will save some battery. GPS+GLONASS does SOMETIMES make reception better in built up areas and under trees but it sometimes makes reception worse. GPS+GALILEO seems to make no difference or some slight, positive difference – but then sometimes it’s 50m off. Other reports suggest occasional urban improvements. End Goal: It’s UNLIKELY that GNSS technology will deliver accuracy & precision in larger cities from a satellite signal alone. Buy a footpod. It seems that the Fenix 5/5S/5X Plus have a single frequency GNSS chip using the E1 frequency (Galileo) and the L1 frequency (GPS). My understanding is that the accuracy of Galileo with single frequency is similar to the accuracy of GPS with single frequency. The massive improvement in GNSS accuracy is most likely to come from dual frequency Galileo (frequency E1 and frequency E5a). Let’s start off with a GPS-only cycling track from a Garmin Forerunner 645 a while back (645+GPS: bear with me!). Here is the same roundabout more recently with the 935 and Fenix 5S Plus both using GPS+GALILEO. Once again the Wahoo (GPS) is there too and is as good as the Fenix. Is the 5S any better at that roundabout than the 645 from a few months ago? Probably. Slightly. Was it as good as the Amazfit Stratos or Wahoo? Maybe not. The most obvious point is that Galileo, in its current incarnation on Garmin, is not a mind-blowing step change for improved accuracy in open conditions. Let’s look at some more examples. When cycling, the level of accuracy shown above is OK for me. But I might as well turn GALILEO off as I can get a similar quality level just with GPS. Initially I had some promising GALILEO results but the closer I looked the more I found little problems. They culminated with this running ‘race’ in easy and open GNSS conditions. As it was a race I only wore one device, so I’ve drawn the correct route in white. Clearly, in this one case, GPS+GALILEO was rubbish. I’m just not going to waste my time with it for now. Longer term there is the potential of super-accuracy but, being fair to Garmin, the GALILEO constellation of satellites is not yet fully ready. The white line was the actual route which cunningly avoided entering a National Trust property (Ham House) that would have required me to pay to enter and the blue line also shows me running through 3m high, THICK brick walls…hey I’m tough but….not that tough. And from a different run where the 5S again seems to outperform the 935, both with Galileo enabled (colours reversed). Further on in that same run, however, the 935 almost nails a very difficult section and the 5S struggles somewhat to even find the right side of the road over the bridge…and that means it was wrong by more than 5m. My formal test for the Fenix 5S+GPS+GALILEO scored 75% which is ‘acceptably good’ (Complete results linked to here: link to the5krunner.com). But a premium device with the supposedly ‘best’ satellite system should be scoring 85% – certainly it SHOULD be over 80% where it would be in the exalted GPS company of some Polars and some Suuntos. Anyway, normally I would say 75% is perfectly fine for most people to use but, as above in my race through the brick walls at Ham House, you might get adverse results from time-to-time. The Edge 130 and Fenix 5 Plus range are single channel GALILEO. GALILEO (or GLONASS) will use more battery. GLONASS was said to use 20% more battery. Note: Garmin have experienced some bad OWS GPS performance in Summer 2018. This should now be resolved. If I were so inclined, and just like any other reviewer, I could present you with numerous SELECTIVE screen shots of the Fenix 5S Plus’s GPS performance and either tell the story that it was brilliant or totally rubbish. It’s neither. Overall I’d say it was ‘acceptably good’ but that would be looking at the GPS performance alone. When you factor in the price of the device and the fact that it is a supposedly top-end device then, well, you might have another opinion. I’m not going to say anything. Tell me what YOU think below. Let’s start off with an easy run in open sky and a right turn running Westwards under some light tree cover. It all looks pretty good here. The jagged lines of the two Garmins are a little strange though. Bring in a bit more tree cover from larger and slightly more mature trees then the differences (all GPS only) are more pronounced. On the top section of the route below the 5S is probably the worst of the three but on the bottom section it’s probably the best. Hey ho! On a different day when cycling, below, the COROS is slightly the worst of the three. I find these multi-lap tracks quite fascinating. The devices do usually seem to be operating within relatively tight performance boundaries of accuracy. Even with a tighter curve thrown in the Fenix 5S Plus seems to slightly edge the winning performance. However, it’s not all sweet-smelling rose at junctions – as the following image shows on a different day where the 935 is about right. And the 5S Plus…isn’t. But the 5S soon corrects itself. What about swimming I hear you cry? “Pants”. I shout back. Below. As a consequence of that firmware downgrade I have not yet done my GPS test route and so don’t have a GPS-only %age figure for those of you (us) that like that sort of thing. I am waiting to get some pesky races out of the way and also hoping that Garmin tweak the firmware in the meantime. Putting OWS to one side, the Fenix 5S Plus seems in line with the better, recent Garmins in terms of GPS performance. That means it is NOT MARKET-LEADING and needs to do better for the price-point. Edit: I have now completed formal tests. the OWS issue shave been resolved. GPS only performance IS THE BEST. GPS+GALILEO can SOMETIMES be better than GAP-only but, more likely, will have bad periods that make the overall experience of GPS+GALILEO worse than GPS alone. The accuracy of GPS-only has changed throughout 2018 with various firmware upgrades that DOWNgraded performance. All seems now much improved (Oct 2018). In fact I would now say that the 5S Plus has shown me the best performance so far of GPS-only performance of ANY PREVIOUS GARMIN. But its best is still nto as good as some Suuntos and Polars on a good day. This is the section where I normally tell readers to forget oHR and buy a chest strap. However I don’t seem to have had as much luck as usual at breaking Garmin’s oHR. I think the optical sensor is the same. Maybe it’s the hot weather? Maybe algorithms have been tweaked in places previously untweakable? Optical HR results from ‘Steady state’ or ‘endurance’ or ‘aerobic’ running SHOULD BE GOOD from all manufacturers. When swimming or cycling or doing a gym class or running fast intervals YOU MAY be lucky and the way YOU do things and your physiological make up just MIGHT give you perfect results. Or not. Probably not. For ME PERSONALLY I find Garmin’s ELEVATE and Polar’s 6-LED sensors give ME the best results on the wrist. But neither are good enough for the my precise HR-recording needs; I use HR to determine my training load. So I always either rely on a chest strap (HRM-TRI) or, occasionally, an optical sensor on an armband (Wahoo, Polar, Scosche/Valencell). I fully appreciate that some people don’t want to (or can’t) wear a chest strap. If you are one of those people then Garmin/Polar are your best hopes of wrist-based optical HR accuracy. But it still might be inaccurate. And when I say inaccurate I mean WRONG and not just ‘a bit off’. We will come on to Firstbeat Physiological algorithms later on…they’re generally awesome/clever..BUT they are mostly based on HR. The phrase “Rubbish In…rubbish out” is worth remembering (hint: buy a chest strap to enjoy the Firstbeat awesomeness). Garmin’s oHR does NOT work when swimming. You will need to use a HRM-SWIM or HRM-TRI to record HR when swimming with Garmin. Garmin niftily allow the oHR to broadcast from your Fenix 5S, effectively turning the Fenix 5S Plus into a heart rate monitor for other equipment such as when you are in a gym or riding a bike with a separate bike computer. There are plenty of other ‘clever’ heart rate based settings. For example you can pair a chest strap but if you forget to put it on then the Fenix can default to use its optical HRM (or not..you choose). If you use a chest strap then you can record HRV values into your FIT files to later analyse. This section is more concerned with accuracy. I could present a case for the Fenix 5S Plus’s optical HR being RUBBISH or BRILLIANT. I’ve just said my piece, so these charts frm the Fenix 5S Plus are provided to be illustrative of what you might expect – some of the worst parts of the performances will easily be replicated FROM ANY OPTICAL HR DEVICE ON THE WRIST. Here we have a steady-state run followed by 10 minutes above threshold and then some 30-60 second faster efforts with recovery. The Fenix 5S is the worst of the 4 but only VERY marginally so. I’d say this was more than acceptable. The following run wasn’t so good and, surprisingly that was at a lower pace. Although I was running for much of the time on uneven ground which was probably the cause of the 5S letting Garmin down a little. It’s worth bearing in mind that VIBRATIONS will affect oHR accuracy. I’d say the following performance was not quite accurate enough (for me) but probably OK for most people. This run shown some NVHIIT intervals at 10 minutes. That’s short for ‘not very high intensity interval training’. I was experimenting with very short recovery and not going as fast as I should in between. You know, “One of those days”. Clearly the 5S Plus was also having ‘one of those days’ and seems to be recording someone else’s heart rate at the start, as mine wasn’t high enough for its lofty standards of sporting excellence. Anyway. We made friends at 6 minutes and after that all was good. This is a much longer Z1 run. It was hot and I was fatigued. The Fenix 5S performed nearly perfectly. The following bike ride gives very similar results. Although a sustained 30 minute effort 2/3rds of the way through shows the 5S Plus faltering a little. This felt like a harder effort at the time; but the chart says otherwise. The Fenix 5S Plus is DEFINITELY wrong. But I’m not sure how correct the HRM-TRI is on the 935 as I didn’t have a 3rd device recording HR. The 935+HRM-TRI is probably ‘about right’. This was the cycle return from a lake swim and, interestingly, the outwards journey was similarly bad for the 5S. The road I use is quite bumpy and that may have caused the optical HR some issues. Here we go with an easy hour on the road. Mostly Zone 1 with some 30-60 second hill bursts. The Fenix loses it a little towards the end and, strangely, that’s what I’ve exactly found with other recent Garmin devices using OHR on the road. Putting the end section to one side, the Fenix 5S performed very well on the road. With the Fenix 5S Plus I have found a generally good performance. It’s an almost too good to be true set of performances. So please take me results with a slight pinch of salt. From bitter experience with previous oHR devices I expected the 5S to be notably worse than what it was. Note: These results are all from a period of VERY HOT weather in the UK. Perhaps such temperatures aid bloodflow nearer the skin and provide better conditions for oHR?? My understanding is that Garmin use a combination of DEM and 3D-GPS to get the ‘general picture’ of the elevation plot but overide that general picture with finer details from the barometric altimeterr. If you think about it a DEM cannot be accurate to the level of a square centimeter, there would be too much data as well as imprecision in the GNSS location. The changes over, say, a metre will come from the barometer. This is a bit like Suunto’s FusedAlti…but potentially better because of the onboard map data. Below I have compared an elevation performance to a GPS-corrected altimetry profile that you can assume to be correct (yellow). I did NOT specifically calibrate the devices at the start for the current location, this explains the differing start heights. So we should get parallel lines…which we almost do. The Fenix 5S Plus WAS set to calibrate DURING ACTIVITY, as above, and yet is clearly the worst of the 4 devices. The other devices are all cheaper than then Fenix. The weather on the day in question was ‘stable’ so I would be surprised that there were barometric air pressure changes that could account for a 10m fall in elevation over 90 minutes. so there’s something else going on that I don’t understand. This drift is typical of many Garmin devices I’ve looked at for elevation plots. Firmware v3.20: Here is another ride on later firmware where the 5S Plus was calibrated to the DEM at the start of a 100 mile ride. Hilly for once! With continuous recalibration enabled on a day with quite changeable weather (and hence pressure), the 5S Plus performed well. The Wahoo much less so. This is one area of running that developed a lot in 2018 and will continue over the next few years. Essentially a running power meter is a proxy for effort. Theoretically your best possible effort will come from an evenly paced run with equal efforts uphill and downhill. It’s cool. I use POWER a LOT. It’s not perfect but has its uses and many cyclists love running power; as the more techy cyclists already have a thorough understanding of power from the ‘proper’ power meters on their bikes – albeit they work differently. But you need more kit to take advantage of this. The cheapest way is with a HRM-RUN chest strap that supports Running Dynamics. The HRM-TRI or RD-POD will be cool as well. A properly calibrated footpod will further improve accuracy and hence usefulness. If you already have that hardware then go forth and download Garmin’s free Running Power (GRP) app. Be wary of the accuracy of the inputs from your sensors. Rubbish In…Rubbish…well, you know the rest. Taking it more seriously you’d go for either RunScribe or STRYD. More options may emerge in 2018/9, indeed I HOPE Garmin do a power pod of some sort. There are LOTS of resources on this site about the Running With Power devices and apps. I’ll link to some in a minute but this table is a good place to start. Clickable, I will clarify the Vantage V offering as more details emerge and as I start to play (I mean train) with it. I encourage you to give running with power a go. Try out the free GRP CIQ app. Get RunScribe if you are interested in dual-sided metrics and special gait metrics. I use STRYD every week and consider it ‘accurate’. You get all of this clever stuff from Firstbeat thrown in. And it is clever. Be mindful that optical HR from the wrist might cause issues with the accuracy of the data that Firstbeat has to deal with. Any data inaccuracies should be rectified by a chest strap and most newish chest straps should also produce HRV data that some of the Firstbeat algorithms like/need in any case. FWIW I always wear a Garmin HRM-TRI chest strap, the HRM-RUN is perfectly fine if you just run. A higher VO2max makes sport AND THE PHYSICAL RIGOURS OF LIFE easier. Sometimes us sporty people forget that. VO2max is a relatively definitive metric of fitness. Improving it should indicate you are potentially faster but, critically, it does not take into account the economy of your technique. So we could both have a RUNNING VO2max of 60 but if your running gait is more efficient than mine then it’s very likely you’ll beat me in a 5k. Maintaining your VO2max can also reduce the physiological impact of stress, makes it easier to recover, and can help stave off the effects of aging. You can’t generally do anything with VO2max. It’s a marker of your progression or badge of honour, depending on how you want to see it. Whilst Garmin say the high 50s are ‘superior’ really I would say that elite athletes will have values in the high 60s – or higher. Like the analysis behind VO2max, Performance Condition (PC) looks at the relationship between your running speed (or cycling power) and heart rate. You are sometimes prompted with your “PC” about 5 or 6 minutes into a run but you can also display it continuously as a data metric and/or analyse it afterwards. Using your VO2max as a baseline, Performance Condition tells you how your current run is stacking up to expectations. Early in your run, your Performance Condition is likely to reflect on your level of recovery or a handful of external factors. As your run progresses, decreases in Performance Condition will likely to match up with the onset of fatigue and your body working harder to keep pace with your fresher self. Here we have a long Z2/Z3 hour bike ride (based on power meter data) following a swim. I’m not sure if this is how a Performance Condition chart is meant to be. 4 hours seem to mark a turning point in performance as fatigue sets in. Maybe there is an extended post-swim adjustment & ‘warming up period’ ?? You might choose to monitor PC during a run or ride and ‘go for it’ when PC values are positive. As the PC figures decline throughout a session then you might get to the point where you curtail the hard stuff. I seem to notice a warming up factor where it takes a while for PC to peak. I’m not so sure it’s meant to do that but, assuming my data is correct, then this could be some kind of artefact relating to the efficiency of my warmup. ie you might be able to use it to assess if you are warmed up. The two Training Effect metrics are important and, in my experience, they seem to reflect well the session I’ve just completed. The further away from race day you are and the longer your race is to be then the more important achieving a high AEROBIC training effect is. Typically you will see the effect from the whole workout at the end of the workout and the screens shown below will also be stored in your workout history on the watch. To progress and improve, you need to challenge yourself in the right way and at the right level. Aerobic Training Effect analyzes your performance to reveal the impact of your activity on the development of your cardio-respiratory system. The fitter and more active you are, the harder you need to work to improve. Behind the scenes your watch takes this information into account to ensure that the Aerobic Training Effect feedback you get always reflects your own personal situation. Note: prior to the introduction of Anaerobic Training effect in 2017, Aerobic Training Effect was simply called Training Effect. TE can also be shown as an accumulating metric throughout your workout. Other vendors (eg Suunto) have introduced adaptive workouts that target TE goals and curtail the workout once you have achieved the goal. A powerful metric, this analysis reveals the impact of your activity on the development of anaerobic performance capacity. A lot of the confusion surrounding Anaerobic Training Effect comes from the fact that it doesn’t necessarily have much to do with how much time you spend in what some people refer to as the anaerobic heart rate zone (>LTHR/AnT/LT2/Z4). Instead, Anaerobic Training Effect is designed to accumulate when you challenge yourself with sustained bursts of intense effort interspersed with lower intensity efforts that give your body a chance to recover. HIIT sessions are a great way to register a higher Anaerobic Training Effect score, especially when the intervals performed focus on efforts in excess of your VO2max. If you trained with me then, for sure, I would be looking at your Training Load (TL). It’s important. Whilst TL is still more complex than that presented by the Firstbeat metric, this is a great place to start. Long runs, tempo runs, intervals, cycling, going to the gym? Mix things up, it doesn’t matter. Firstbeat’s Training Load reveals the combined physiological impact of all your activities in the past 7 days. What are the numbers? Your Training Load is ‘simply’ the sum of the EPOC values of your activities. EPOC is used to describe homeostasis disturbance and when placed into the context of your fitness level (VO2max) and activity history also provides the basis for your Training Effect. 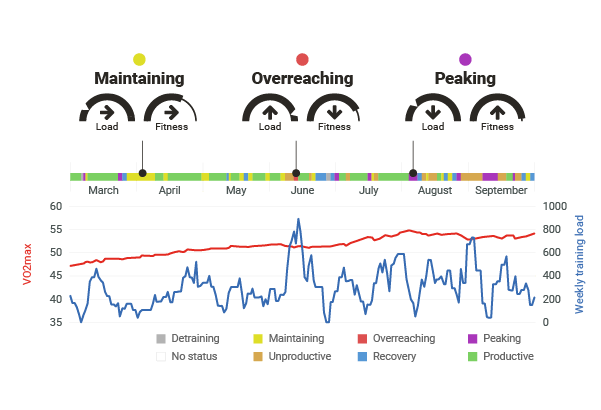 In the world of elite sport, sports scientists are increasingly turning to this type of training load data to help athletes reduce injuries through smart application of load over time. Firstbeat Factette:Training load for cycling requires a power meter. This surprisingly popular feature combines the insights of Training Load and VO2max to reveal the relationship between your activities and your personal fitness level. The feedback it offers gives you the ability to evaluate the effectiveness of your programs and routines, understand where you are in a training cycle, and learn how your body responds. If you are following a proper training plan geared towards a specific race then Training Status may be a good check of how well the plan is working for you. Another EPOC-based metric, Recovery Time looks at the degree of homeostasis disturbance resulting from your most recent effort combined with the amount of time remaining on your recovery clock to predict when your body will have completed the work or restoration and adaptation. One popular misconception regarding Recovery Time feedback is that it should hit zero before your next session. What it’s really telling you is how long it will be before your body is ready to benefit from a tougher, fitness improving, workout. What’s a fitness improving workout? Essentially we’re talking about sessions with an Aerobic Training Effect of 2.5 and above. Lighter efforts are a good way to promote recovery, as long as you don’t over do it. I don’t treat this measure as the ‘truth’ but I certainly take it into account when training frequently. For example if I do an evening workout and I get a recovery time of 21 hours then I may delay any workout scheduled for the following morning. This is the only training metric onboard the Fenix 5S Plus that absolutely requires that you have your watch paired with a chest-belt. This feature uses Heart Rate Variability (HRV) data captured across a range of intensities to identify your lactate threshold. Your lactate threshold responds to training, meaning you can improve it by challenging yourself in the right way. Once your device has detected your lactate threshold, you have a chance to use this information to personalize your heart rate zones based to match your personal situation. You will get a Lactate Threshold heart rate AND and Lactate Threshold pace. If you are not so fit then you might be able to maintain this for about 40 minutes but the fitter you get the longer you can maintain it for ie WELL over an hour. For me it’s not quite my half marathon pace, if I only run-trained I reckon it would be my HM pace. Personally I think the LTHR may be slightly over-estimated by a few BPMs. Your Functional threshold Power (FTP) for cycling represents the highest, constant level of power that you can produce whilst not accumulating lactic acid. It’s probably NOT 60 minutes for most of us…probably less. Maybe higher for those who are well-trained. Regardless of that, we tend to say it’s your “60 minute power” and we derive power zones and other training insights from that. You can estimate your FTP in a shortened test or measure it in a lab test. Firstbeat derive estimates of FTP from your ‘normal’ efforts, which is potentially less hard on your body than some of the FTP testing protocols that exist. Stress can be something of a mystery, but it doesn’t have to be. The Garmin Fenix 5S Plus features a special heart rate variability-based analysis capable of revealing the presence and intensity of the stress you experience. Checking in with this feedback will allow you to pinpoint activities, interactions, and events that produce stress in your life. You can also see when your body is in a state of rest and recovery. This can be particularly important when looking at your overnight stress data, which will shed some light into the restorative quality of your sleep. When examining this feedback, it’s essential to understand that stress isn’t necessarily a bad thing, and experiencing stress is an important part of life. The key is to ensure that stress is offset with adequate recovery, and maintaining this balance between stress and recovery is vital to being able to benefit from the challenges you experience in life and through your activities. Forerunner 645 Shown: If I could do a 2:50 marathon at London I would be ‘quite pleased’. There really is no viable competition to get anywhere near the same sort of level of sporting fucntionality. Certainly NOT in the smaller format size of product. And the new Fenix 5 Plus range is clearly Garmin’s ‘smrtest’ product with the broadest feature set…ever. Maybe the Suunto Spartan Trainer is a viable smaller format triathlon watch? Maybe. But it has nowhere near as many features. Really the questions we should be asking are “Is the 5S Plus a better running watch than the Forerunner 645 Music?”. Yes it probably is. And “Is the Fenix 5S Plus a better triathlon watch than the Forerunner 935?”…Yes it might be for many people. I am often highly critical of Garmin for a lot of things. As I have absolutely ZERO relationship with them other than being a consumer like you I can be critical. (Yep no PR samples here, no PR info here at all, I am NOT a Garmin Shill). Having said that you should know that the Fenix range is Garmin’s diamond in its cash-generating, Golden Crown. So if there are bugs Garmin ABSOLUTLEY WILL fix them if it’s possible as a matter of urgency. Garmin have the developer resources to do that. Anyway. Here are some issuettes and bugs that will hopefully be fixed by the time you read this. I have no special channels where I can report them or expedite them at Garmin. As I said above, I have no links to Garmin at all. Best Amazon price is linked to. Prices start at Eur700/$700/£600 and might fall slightly in 2018. Buying from Amazon supports this site. Global availability is now generally GOOD. There are some specific distribution restrictions in certain countries where selected retailers have exclusive access to specific models (usually the 5X Plus). Garmin are now effectively selling the 5 Plus and 5S Plus as the same product but in different sizes. Thus the Amazon links above/below take you through to the page where you can choose the size you want – 5 Plus or 5S Plus. It’s EXTREMELY unlikely that you will get notable discounts on any of these products in 2018. Maybe $/Eu/£50 less than the RRP if you are lucky. I appreciate you may shop around for the cheapest deal and not buy from Amazon. If you would like to say thank you for this review then please click on the Amazon link immediately below for your next Amazon purchase of anything else. Thank you! In this Garmin Fenix 5S Plus Review we have found, once again, that Garmin have produced a most amazingly complete watch full of every imaginable option. Even more unimaginable options than before are included ;-). Finding those features on the deep and complex menu system is, however, tricky at the best of times. Once again the GPS sensor lets the overall package down slightly and should act as somewhat of a deterrent to non-casual runners looking for an element of precision in their training. For those of you willing to augment the Fenix 5S Plus with a footpod purchase then those inbuilt sensor issues will go away. That’s what I did. I’m also not too sure about the aesthetics. Whilst it must be durable, that steel bezel just doesn’t sit quite right with me (other options available) and the 240x240px screen resolution just makes the 24×7 watch faces look a bit tacky for a $/Eu700/£600 watch. Is it worth the upgrade from the Fenix 5S? – I’d say yes. It has a bigger screen than the 5S, more features and some hardware faults that remain UNfixed on the Fenix 5S NON-plus model. Is it worth upgrading from a 935 to a Fenix 5S for tri? – Again I’d, surprisingly, say yes – in part aided by the smaller form factor. Put the battery life to one side for the minority of you who want to do IM races and the 5S Plus is great. It has more tech features than the 935 and is only a tad heavier and a tad thicker. VERY RARELY for me I entrusted the Fenix 5S Plus to my wrist during some PROPER races while ‘testing’. Remember though the 5S Plus is only better because of the NEW, non-Tri features. The streaming music stuff is still not fully there and the addition of Spotify (+Deezer) and other providers are needed to keep more of us happy. However Garmin’s music offering is competitive and will improve. BUT it’s the button-based handling of on-watch music that is great during sport. I like the new maps functionality. It’s great for casual and recreational navigation. For more serious navigators and for cycling use on trails then you would be better advised to get something with a bigger (touch)screen. However The Fenix 5S Plus just seems better powered than my previous 5X, making the mapping usable but still on the slow side when route planning. Working with the map would favour a touchscreen but I’m glad there is no touchscreen to spoil the usage of the rest of the watch’s functions. Garmin PAY is good for me. i set up a special UK Starling bank account as my normal one is not supported. Provider coverage needs to increase to cover YOUR bank but maybe it’s not a bad idea to have a different bank for casual, low value payments in any case? The Fenix 5S Plus is very, very close to becoming my go-to sports watch. My longer races might just keep me on the Forerunner 935. Remember I have all the gadgets to get around the failings of the Fenix 5S Plus. But I suspect many of you won’t be that bothered about some of the things that are important to me. In which case, if you can afford the Fenix 5S Plus, love the wealth of features and want that smaller form factor – then you know what to do. The killer line :: if you want a smaller format watch then the Fenix 5S Plus has no competition. It is the best. One big item for me that probably won’t impact most in the short run, is that CIQ apps can use 8 times more memory than the 935 or Fenix 5/5S, same as was available on the Fenix 5X. But this will allow for more sophisticated apps, which in time could add real value. Now if they’d just come out with the 935 Plus, I’d upgrade in a heart beat. also of note: there is a serious elevation bug impacting the entire 935/Fenix 5/Fenix 5Plus line, smoothing out elevation in certain cases, causing ascent/descent values to be low by as much as 33% in hillier routs. They just released a beta fw for the 935 today that will hopefully fix this. thanks @ecutter. will add a note on the elevation, that might go some way to explaining other results i’ve found. CIQ: yep I should have looked a bit more into that. I was going to see how maxxing out the ciq apps affeted the mapping. I tend to deliberately test new devices with as little extra gumf going on as possible (at lest to start). even in that state the 5s+ was slow at times. The new CIQ 3.0 map integration is interesting (doesn’t work on the 935) but is actually fairly limiting when you dive in to it. It’s a start though and gives hope they will build on the functionality here. My initial testing with the 9.73 beta fw in the 935 is promising for fixing the elevation problem. Looks like they also released a beta for the F5/5S but not the 5X. Not sure about the plus versions. Great review. You wrote under FIRSTBEAT GOODIES: “Garmin Fenix 5S Plus and Quick Stress Level Test…Intentionally blank for now.”. Would love to see a comparison between the Oura ring, Whoop, Emfit and HRV4Training (really like Marcos science based approach) with Scosche Rhythm 24. Can their algorithms really predict overtraining? Nightly wear vs just morning measurements? Short term changes in stress response (RHR, sleep disturbance, HRV, mood measured with questionnaire) with training load vs trends over time. …oh, and I have not seen a good review anywhere of Polars “Orthostatic test”, “Recovery status” and “Fitness test” either. Forgot about Polar. Thank you for replying 5K (yes, 5K is now your rapper name if you ever needed one 😉 ). Just subscribed as a supporter and I encourage anyone reading this blog to do the same. The cost is LESS than what you spend on two single Saltstick capsules…per month. Do no be a cheapskate, the authors rapper career may not pan out…click and Paypal now. I suspect my rapping career would make more money than this one. Wow, mega, hiper review. Thank you. I’m curious about your thoughts on battery life, and if you’re experiencing any of the excessive post-GPS activity battery drain discussed in the Garmin forums. I’m using a 5+ Titanium coming from a 935 and I was specifically interested in the maps, but the 5+ doesn’t come close to giving me the battery life that the 935 did. I’m also losing about 10% of battery in the few hours immediately after a GPS activity, and then it somewhat “normalizes” again. The battery drain during GPS activities is larger than that of the 935, but manageable. I haven’t read the forums tho i’m not surprised at what you say. my understanding is that a NEW device might need a couple of complete charges/discharges for the battery to work properly (don’t know whay that’s supposed to be true). but,…yes. I thought the drain on the 5s plus was a little more than i expected. could this be firmware? could this be jsut starting to regularly use more of th efeatures or is it just the result of battery degradation over time.